Just add boiling water. Low fat and sugar. Suitable for vegetarians. 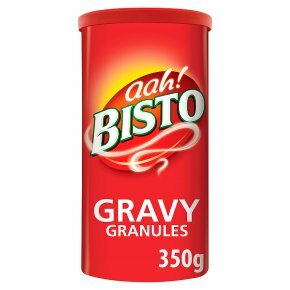 Bisto Chicken Flavour Gravy Granules 1 Put 4 heaped teaspoons (20g) of Bisto granules into a measuring jug-for extra thick gravy add more granules at this point. 2 Add 280ml (1/2 pint) of boiling water to the granules. 3 Stir vigorously and continually until you get a smooth gravy. Serve & Enjoy!